This coastal multi-use walking and mountain biking track takes you through to the northern end of the park. 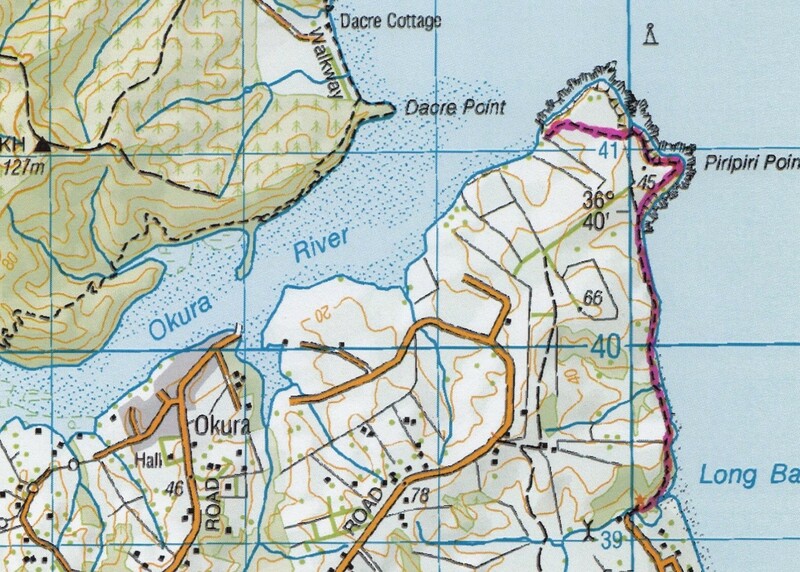 Along the way you can walk through several areas of coastal bush and access both Granny’s and Pohutukawa Bays. 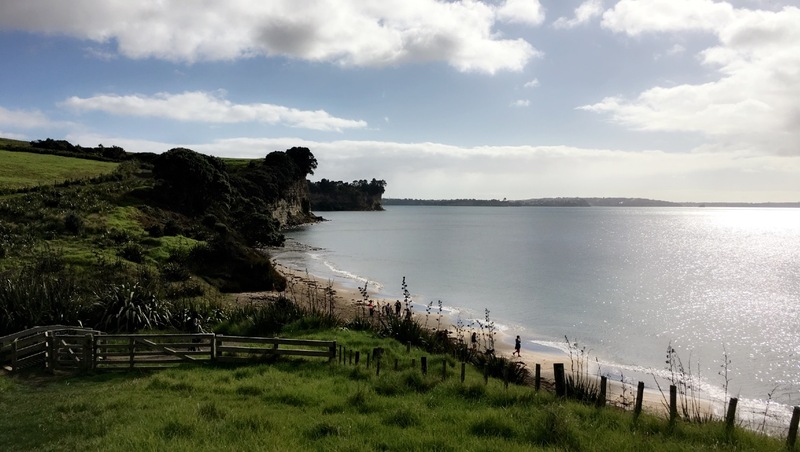 There are several high points along the track which provide some stunning panoramic views of the Hauraki Gulf. Dog walking is permitted on this track as long as they are kept on a leash (only accessible via the beach and crossing the Vaughan Stream mouth). Follow the red markers. Walking Track, 6km, 3hours. (Source). In my defense at that point, as I’d only just started trail running I didn’t know that things such as topomap existed, if I did I would have clearly seen that you can’t make a loop and that this is a strictly out and back trail. 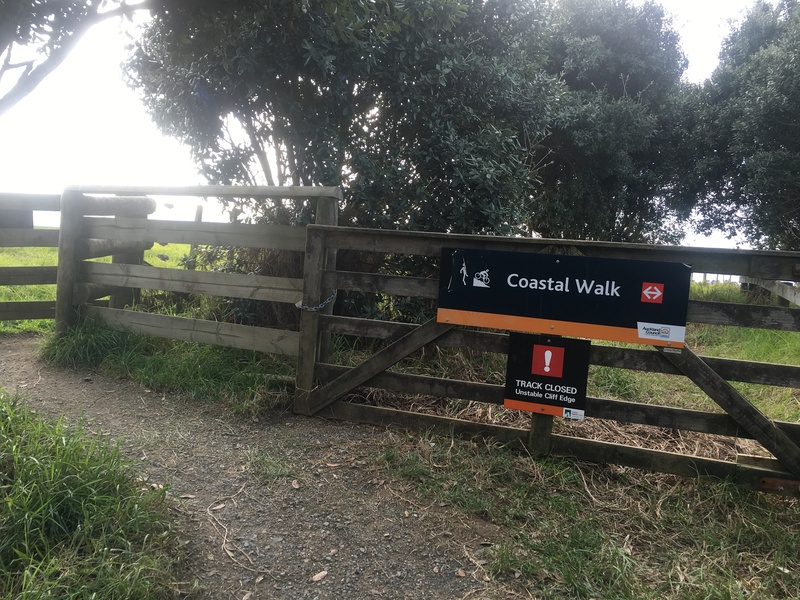 I will say that I’m not entirely sure how they came up with the 6km trail length that is noted on the Regional Park website because if you start at the beginning of the Coastal Track and go all the way to the Okura River Mouth it’s only 3.6km (one way). Even if you add the entire length of the beach front (or driveway) it’s only an additional 1.1km (one way) so I’m a little confused – also that time listed (3 hours) seems to be EXTREMELY overstated, perhaps they imagine you’ll stop a lot along the way to admire the views, which is quite a fair assumption (as assumptions go). For this blog post I’m going to write as if you are starting the trail at the end of the driveway (as that is the official starting point). I’ve always found ample parking at this end of the driveway (although I do run when most people are still at work (or asleep)) but even if you can’t park in the bay just before the no parking area you’ll easily find a parking space not too far away. From here continue down the driveway (following the signs), veer right to cross over the bridge and continue to follow the path that hugs the coastline (passing the Vaughan Homestead en route). The lower section of the track hugs the beach and you can link up to it at this point if you have chosen to traverse the 1km beach front first although be warned you will probably get wet feet as you will have to cross the Vaughan Stream. I have seen trampers rock hop but I just plow straight across. The section after the beach heads up the cliff (with the aid of stairs) and it’s quite narrow, so much so that it’s hard to pass other track users (most of which have kids in tow) but once you go through the gate at the top of the track the path widens significantly, this new track (as the original coastal track is closed due to erosion) zig zags it’s way down the hill all the way to Granny’s Bay. After climbing out of Granny’s Bay you’ll descend again into Pohutakawa Bay which is a nudist beach, however I’ve yet to see any naked people when I’ve run past (although once when I thought this entire section of beach was empty I went onto the beach for a walk and a male head popped up out of the long grass, so perhaps it would be a better idea if you just stick to the track). As you continue up the hill after Pohutakawa Bay the gravel paths ends and you follow the fence line along a grass “path”. This section is perhaps the most boring as although you are still on the coastal side of the cliffs, you’ll only catch glimpses of the ocean through all of the trees, scrub and gorse. You can however see the cows (and pukekos) hanging out on the other side of the fence, although the first time I saw them I thought they were a pile of tyres (the cows that is, not the pukekos) ..
At Piripiri Point you’ll come to a large open area of grass, the first time I traversed the Coastal Track, this point seemed like it would be the end of the track, but it’s not – just continue following the fenceline to the left until you reach the Okura River Sign, that is the official end point of the Coastal Walk. 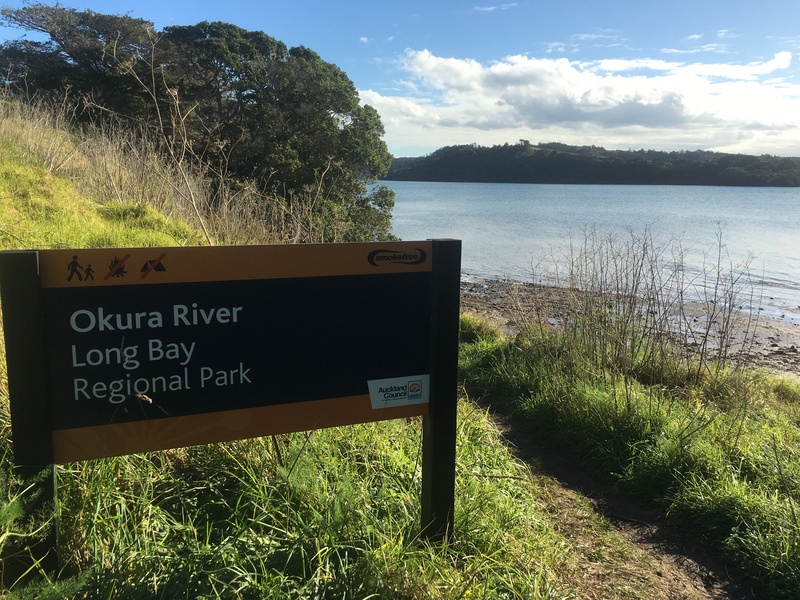 At low tide you can continue across the estuary to the Okura Bush Walkway on the other side however be careful as the rocks on both sides of the estuary are extremely slippery, I used hiking poles for stability. Parking? – Yep a tonne! Parking bays are located all along the beach front. Toilet Facilities? – None on the actual track, but plenty along the beach front (which you have to pass to get to the track).